What are your current lead generation ideas costing you? If you’re generating leads that are hard to nurture and convert, then they cost a lot. You’re not just looking for a way to generate more leads. These leads need to generate greater profits. Otherwise, you’d just spend a couple thousand on a cold call list. You’d spend all your time getting hung up on and taken for a ride by people who really don’t want your services. The quality of your leads determines how quickly and effortlessly you can use those leads to generate profits for your business. These leads continue to generate profits for the lifetime of that customer. And as a happy customer, that customer will help you generate more quality leads by recommending your business. The goal isn’t just to generate more leads, but the right leads. These top 5 lead generation ideas are how to make that happen. As entrepreneurs, we like to talk a lot about ourselves. If we didn’t have a healthy confidence level, it would be impossible to do what we do. Your target customer appreciates that confidence. But they need something more. Today’s B2B buyers are turning to companies that add real value. This value comes in the form of information they need for the decision-making process. But this is one area where many marketers go astray. They expect potential customers to think of them as their exclusive source for information. They want to be a thought leader and the final say in their niche. But B2B buying decisions are too complex to rely on one source of information. Think about it from their perspective. Can you really say that you researched and found the right solution for your company if you get all of your information from one place? On top of that, don’t you benefit if they buy your services? This can create a bit of a conflict of interest. Resolve this dilemma with lead generation ideas like this one. This can work for both B2B and B2C businesses. We’ll walk you through several ways you can use this concept to generate more leads that increase profits. An influencer is someone in your industry that people trust. This influencer could be personal brand or a business brand. It’s anyone whose opinion would generally be respected because they know what they’re talking about. When people see this name, they stop and pay attention. This influencer often has a strong following on social media. Their name will sound at least familiar to many people outside the industry. The more familiar and trusted, the more powerful that influencer is. When you think of influencer marketing, you might think of an influencer mentioning you. But this goes both ways. When you mention influencers, it helps build the B2B buyer’s trust meter. If, as an entrepreneur, you follow and trust some of the people they follow and trust, they think you must be like that trusted brand. Answer honestly. Even if you didn’t know the brand that shared the content, wouldn’t you be curious about this list if you knew these influencer brands? This name drop gives an unknown brand just enough clout to get noticed. Create compelling content. And convert that viewer to a lead. You can also curate and then create content that includes many notable brands to get noticed and generate more leads. Don’t get us wrong. These kinds of topics can get worn out and overdone. But if you back it up with well-researched and produced content, it can help you gain visibility that converts to leads. That’s what lead generation ideas are all about. Take this idea a step further by reaching out to the influencer. Let them know they made the list. When you do, you can earn a backlink as well. Backlinks from influencers in your industry are some of the most powerful you can acquire for SEO. They help show search engines that you’re connected and respected in your industry. Alternatively, the influencer may share your list with others on social media. Their followers may share it with their followers. All of this generates more traffic that you can easily convert to leads. 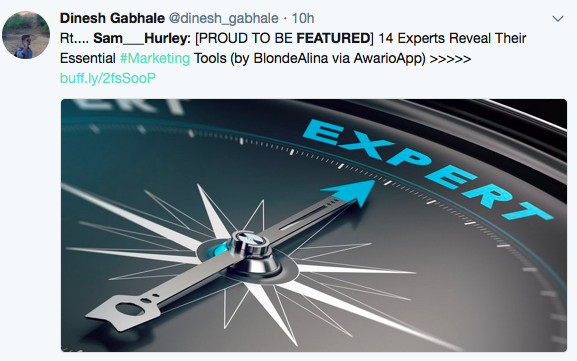 In this example, Sam Hurley, a top-20 digital marketing influencer, shared that he’d been featured in an article. A follower then retweeted it. Not only does this generate leads for the company that published the article. It generates traffic from people who are likely to want what you have to offer as a brand. Lead generation ideas are worthless if those leads don’t result in high conversion rates. Your use of influencer marketing in your lead generation ideas doesn’t have to be passive. Reach out to influencers to obtain an exclusive interview. Create content around that interview. As you do more interviews, create a highlights piece of content. Repurpose interviews into video content, quizzes, visuals and other lead-generating content types. Name-dropping normally has a bad connotation. But as an entrepreneur, success in business has a lot to do with how you network with others. Are you trying to grow your business in a market where you’re relatively unknown? Or are you just looking to expand your reach in your current market? You’ll need the boost you can get from name dropping. Name dropping shows people that you do your homework. You attribute sources. You value the contribution of others. Just consider how many businesses that were on Shark Tank, say “featured on Shark Tank”. It doesn’t matter if they got a deal or not. We’ve seen some use the name that completely bombed on the show. The simple fact that they were on the show gives them credibility with many people. Don’t have anything like Shark Tank to associate with your name? Any reputable source can help. It can be as a simple stating a fact along with “According to the Wall Street Journal, …” Or “Recently published in the Harvard Business Review, …” Which name you drop depends on your audience. WSJ and Harvard will mean something to some. Others might find these sources pretentious. Above all, know your audience. While anyone can drop a name, doing it sparingly can add weight to your brand. There’s value in curation. Just ask the millions of people who use Pinterest to help them make buying decisions. Collecting valuable stats, organizing them and putting them in one place is a great way to help buyers make decisions. Generate leads in the process. Turn it into an infographic. Put complementary stats together. Compare and contrast stats in different industries. Find ways to add value to existing information. But always credit your sources. As you endeavor not to make it all about you, don’t forget your actual customers. Many customers are delighted to be featured on a brand’s website. Create effective case studies. Or let customers tell their own stories about your brand. Place these prominently on your site. When you put customers at the center instead of yourself, you demonstrate you can be trusted. Notice, we said nothing about actually capturing the leads in number one. Lead generation ideas are nothing without an actual system in place to turn visitors and followers into leads. That’s where number 2 comes in. Let’s talk about fixing a leaky funnel. Whether you call it a sales funnel, the Buyer’s Journey or a content marketing funnel, the basic concept stays the same. In each, you’re using some form of content to guide a person down a path. In B2B, this funnel is even more important. You often have multiple decision-makers who need to see different types of content to make a decision. When we’re discussing lead generation ideas here, our primary focus is that space between Awareness and Consideration. This crucial middle of the funnel is where a lot of funnels fail. An enthusiastic entrepreneur quickly builds a following on social media. They have great engagement. Then they struggle to turn that engagement into viable leads. Or they’re getting tremendous traffic to their website thanks to spectacular SEO strategies. But the traffic doesn’t become increased revenues. Either way, it’s a huge problem. But learning how to fix it is one of the best lead generation ideas you’ll find. In the days of automation and segmentation, much of lead nurturing happens online. But there’s still a clear path people take through their journey. Here’s an example of a content marketing funnel. A person visits your social media profile. They engage with your posts. The profile guides them to the website. There you offer them something in exchange for contact information. Once you have this information, you learn more about this person. Using this information, segment the lead so that you can send them more personalized content. Segmented content is much more relevant to the person than the content on your website or social media where you’re reaching many target audiences. Increased relevance translates higher conversion rates. Funnels don’t have to be complicated. Such is the case with the B2C company Ties.com’s amazing content marketing funnel. It all starts when you type in something like “how to tie a bow tie” into Google search. Thanks to some amazing SEO, Ties.com comes in at the top of the search with this schema markup. Schema is a type of code that tells Google, Bing and Yahoo the best way to display your website in search results. The search engine, however, gets to choose whether they show the marked up content. Click to go to the website. You’re greeted by a helpful video. The page also includes text instructions and graphics in case you’d rather not watch a video. Before you leave the site, you get an offer for more great content. 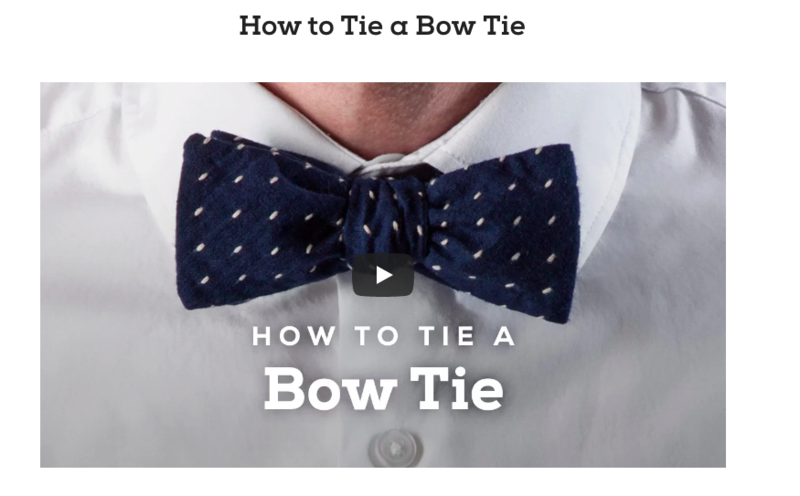 If you want to know how to tie a bow tie, of course you’ll want this eBook! Once this viewer gives an email to download the eBook, the company can learn more to segment and begin sending more relevant content. We’ll discuss this part of it a little later. Use Google Analytics and other paid software to track the effectiveness of your lead generation ideas. It’s so easy to set up funnels to track in your account. See how people interact with your content. Which content converts the most visitors to actual leads? Create more of it. How many people clicked from search, social media, email, etc. Pinpoint exactly where the leak is by determining which step is under-performing. If Ties.com were your company, what questions would you ask to identify where leaks were? How about these? Are you not getting clicks from the search results? If not, work on your SEO, including what shows up in the search. Are people not watching the video all the way through? It may be too long, poorly produced or not engaging. Are people not signing up for the download? The content offering may not be something people want. You may be asking for too much information up front. You may be attracting the wrong audience. 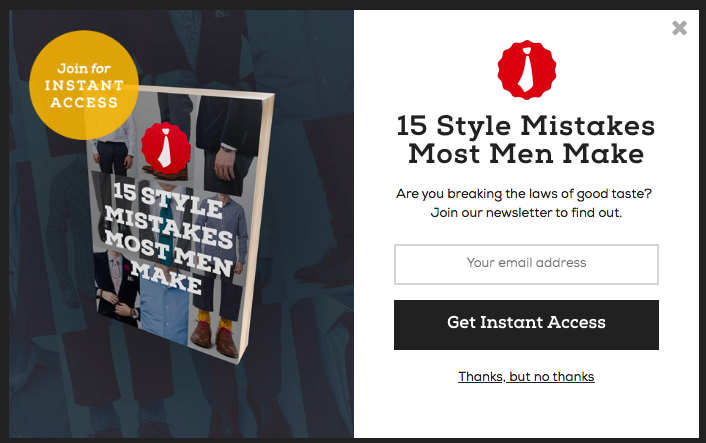 And if Ties.com didn’t have any clearly defined funnels at all, they’d need to address that. Fortunately, they do, leading to an estimated 10 million visitors per year and 30% revenue growth year over year. But lead generation ideas don’t stop there. 59% of B2B marketers say that email is the best way to generate revenue from leads. It’s no wonder. It aligns with the fact that 86% of professionals say that email is the preferred way to receive communications from a brand. When a person offers their email address, they don’t instantly become a highly qualified lead. They’ve just shown some interest in your brand. Nurture that interest through segmentation and automation. Segmentation is the act of categorizing leads in some way to generate more relevant content for each segment. Automation allows you to quickly respond to opportunities you plan for. You don’t have to know exactly when they’ll occur. You can set up triggers that will instantly send a certain message that furthers that person’s journey. It may be to make a sale, remind a person of their interest, provide information or quickly solve a problem. Automation also takes a lot of the repetitive and monotonous work out of nurturing leads. It gives you more time to focus on creating segmented content. These two work hand in hand to generate highly qualified leads. It all starts with data. Every interaction you have with this lead becomes a wealth of information. Put systems in place to collect this data. Aggregate this data. Analyze it. Then take what you’ve learned. Create more meaningful experiences for this lead. Automate content delivery to never miss an opportunity to nurture that lead. Let’s take a closer look at the steps involved in segmenting your email communications. It’s easy to get overwhelmed by data. Too much data can lead to inaction or chaos. Instead, break it down so you can focus. Depending on what your business is and how many leads you’re nurturing, choose a reasonable number of ways to segment your lists. Which of these segmentation categories will be most meaningful to your business and customers? That’s where to start segmenting. Let’s say you choose to segment your list based upon each customer’s top goal. Divide your leads up into segments based upon their goals. Depending on the number of leads and your automation capabilities, this may be 3 segments or 30. Greater segmentation leads to higher conversion rates. As your capabilities allow, further sub-divide your segments by another trait to get even more relevant. Invest in automation tools that will analyze multiple sources of data and segment your email lists for you. Adobe Cloud and HubSpot have some great tools for this purpose. As you create content, note which segment or segments this content is relevant for. Many content pieces will overlap, going out to many segments and sub-segments. Further use automation tools at this stage to get the right content into the right inbox. Many entrepreneurs waste a lot of time and money on “social media marketing” They don’t have a plan to turn engagement into leads that will generate profits. They end up chasing likes and shares and wondering why it’s not working. Social media is an amazing awareness-generating tool. When done right it’s one of the best lead generation ideas out there. It works best when teamed up with other methods like segmented-email marketing. That’s where you can cost-effectively convert that lead into revenues. But you have to capture that lead in order to nurture it through email. It’s social media. It all starts with being social. If people are interacting with your brand and you’re not interacting back, they think you don’t care. They leave. Thank your top interacters each week with a mention. Always respond to comments. Most of the time, responding within a week is okay. If the comment is negative or asking a question, then an immediate response may be needed. Think of commenters as warm leads. They’re showing more interest in your brand than those who are just sharing and liking. Nurture this lead. Ignore it and it will evaporate fast. In the Ties.com example, visitors came in through search engines. They could have just as well used social media at the top of that funnel. In fact a comprehensive marketing strategy includes using lead generation ideas from multiple sources. Building a strategy across platforms and tools is the way to maximize results. Post enticing headlines that lure people back to your website to view content. Once there, offer them content, a free trial or something else of value in exchange for an email. Remember, we’re not only concerned about lead generation ideas. Those leads need to be quality leads that are likely to increase profits. Run contests on your social media profiles. Make sure the prize is something uniquely valuable to your target audience to avoid attracting people who aren’t likely to become customers. Lead followers back to your website to sign up by providing contact information. The leads you can generate through a contest will far exceed the cost for the prize. Lead generation ideas like this can pay you back many times over. It can take up to 13 touch points with your brand before a person becomes a paying customer. And experts estimate that over 57% of the buying decision is done before a person reaches out to schedule or buy something. You do this through content. But what kind of content builds trust? It doesn’t matter how effective your lead-gathering pitch is if the content you’re providing isn’t up to these standards. Your lead generation ideas should generate profits. Otherwise, what’s the point? These 5 ideas have proven themselves again and again. Yet, too many entrepreneurs and small businesses don’t use them because they don’t have the tools or time. To learn more about how we can help you generate better leads and grow your business, contact us today! Thanks for sharing great tips. These are very informative ideas instead of buying leads.